A satellite experiment to study cosmic rays and the solar wind that was devised by school students is now successfully collecting data in space. LUCID, the Langton Ultimate Cosmic ray Intensity Detector, uses particle detectors from CERN to study the radiation environment in low Earth orbit. 16-year old Cal Hewitt, from the Langton Star Centre, will present the first results from LUCID at the National Astronomy Meeting 2015 in Llandudno on Monday 6th July. LUCID tracks the direction of incoming cosmic ray and solar wind particles in three dimensions and determines the type of particle, the energy it deposits and the resulting radiation dose. Monitoring these energetic particles is important for understanding space weather and protecting astronauts from high levels of radiation. LUCID has captured half a million frames to date during its commissioning phase and a further 250,000 will be captured over the summer to build up a map of the radiation environment. 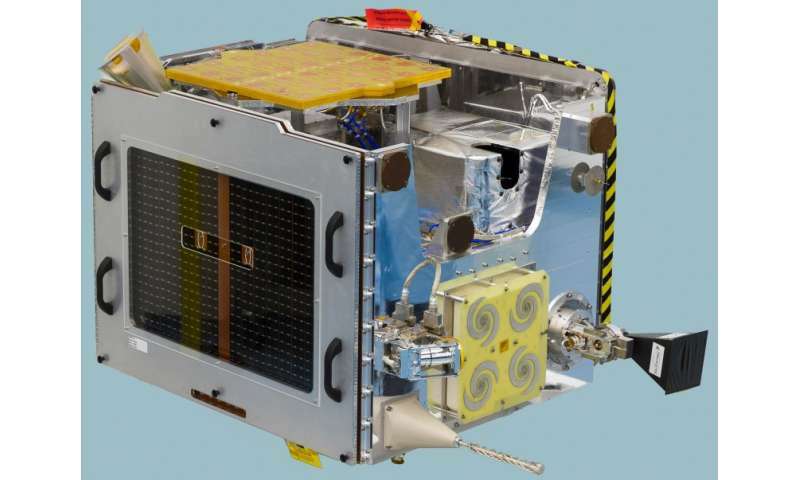 LUCID was launched on 8th July 2014 on the Innovate UK-funded TechDemoSat-1, which carries payloads from a number of UK academic and governmental institutions. The LUCID project was first conceived by students in 2008 and was constructed by Surrey Satellite Technology Ltd. It is one of a number of research projects developed at the Langton Star Centre, the research centre of the Simon Langton Grammar School in Kent. "When orbiting the sunlit side of Earth, the signal detected by LUCID is dominated by the solar wind, allowing it to map the number and energy of protons and electrons against geographical area and time. But when LUCID is shielded from the Sun on the night-time leg of its orbit, we can identify cosmic ray events," said Hewitt. Hewitt, who has just finished his GCSE exams, has worked with a team of students to prepare LUCID for upcoming major runs of data. To access the computing power needed for LUCID data analysis, Hewitt has become the youngest student certified to use GridPP, the UK's contribution to the worldwide grid of thousands of computers that process data from the world's largest particle accelerator, the Large Hadron Collider (LHC). "LUCID has been developed from pixel detectors used at the LHC, which were originally designed for medical imaging. This type of detector has never been used before in open space. Our first data was extremely noisy but we have optimised detector settings for day and night captures. The initial processing of data has been automated and masking of pixels has been corrected to improve the quality of track imaging," said Hewitt. The concept of involving school students in cutting edge research through the Langton Star Centre is the brainchild of teacher Professor Becky Parker. The programme is now being rolled out nationally through the establishment of the Institute for Research in Schools. "There are huge benefits to supporting authentic research in schools: increased student engagement, aspiration and take up of STEM subjects, a reinvigorated teaching profession, improved transition between school and university, increased enthusiasm amongst girls for physics and engineering," said Parker. "This is certainly the case in our school and we would like to see schools across the country benefit from the same opportunities through the Institute for Research in Schools."